The line was opened in 1978 and at the moment it has 13 stations. The total length is 11,1 km. Nemocnice Motol Connection to buses (167, 168, 174, 179, 180, 184, 301, 347, 352, 380), and a night bus 502. Petřiny Connection to trams (1, 18), buses (108, 168, 191, 264), night tram 56, night bus 510. Nádraží Veleslavín Important station for those travelling from / to Prague airport Direct bus 119 to the airport departs from here as well as the Airport express bus. Connection to trams (20, 26), buses (119, 142), night tram 51, and trains. Public transport information office. Bořislavka Connection to trams (20, 26), buses (131, 161, 168, 312, 316, 356), night tram 51, night bus 515. Dejvická (map). Connection to trams (5, 8, 20, 26), night tram (51), buses (107, 116, 143, 147, 160, 180, 340, 350, 355) and night buses (502, 512, 604). Hradčanská (map) Connection to trams (1, 8, 18, 20), night trams (51, 56, 57), buses (131) and also a bus terminal for regional bus lines towards the west of Prague. Malostranská (map) Connection to trams (1, 8, 12, 18, 20, 22), night trams (51, 56, 57) and historic tram line 91. Get out here to walk through Malostranská square up to the Prague castle. Staroměstská (map) Connection to trams (17, 18), night tram 53 and bus 133. Get out here to go to the downtown Prague. 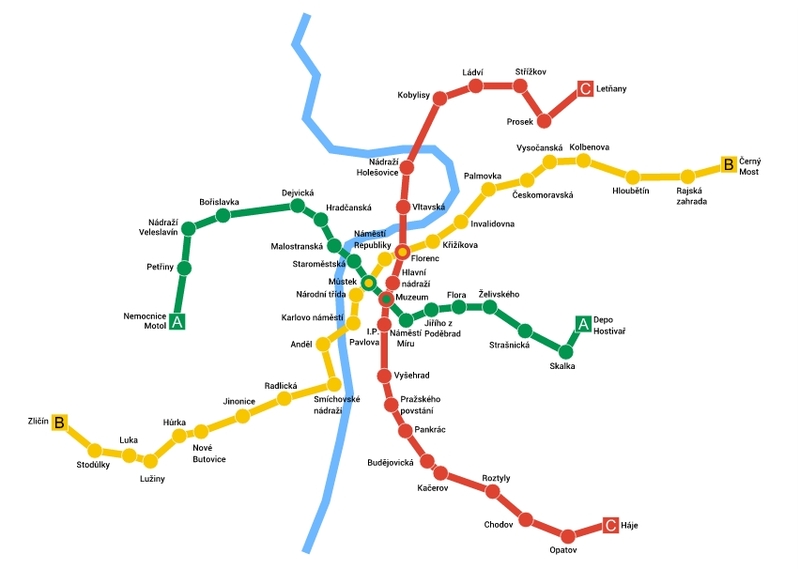 Můstek (map) Transfer to the metro line B (yellow). Connection to trams passing through Wenceslav square (3, 9, 14, 24), night trams (51, 52, 54, 55, 56, 58) and historic tram line 91. Muzeum (map) Transfer to the metro line C (red). Get out here to get to the Wenceslav square, National museum or the Prague State Opera. Náměstí Míru (map) Connection to trams (4, 10, 16, 22), night trams (51, 57, 59), bus 135 and night bus 552. Get out here to see the St. Ludmilla's Church or visit some of many restaurants and bars in the neighborhood. Jiřího z Poděbrad (map) Connection to tram 11. Get out here to see the modern church St. Lord's heart. Želivského (map) Connection to trams (10, 11, 16, 19, 26), night trams (51, 58) and buses (124, 134, 135, 139, 155, 188, 213, 234). Also a bus terminal for regional bus lines. Strašnická (map) Connection to trams (7, 19, 26), night trams (51, 55) and buses (175, 188, 224). Skalka (map) Connection to buses (101, 111, 154, 175, 177, 194, 195, 224, 271, 277), regional bus 329 and night bus 509. Also you can catch here the bus line EUR 1 which will take you to the Europark Hostivař shopping center. Depo Hostivař (map) Connection to tram 7, night tram 51, buses (133, 163, 190, 208, 212, 238, 264, 265, 266), regional buses (364, 382) and night bus 506. You can also catch here special bus lines EUR 1 (taking you to the Europark Hostivař shopping center) and OUTLET (taking you to the Outlet center Štěrboholy).